The Holy Great Martyr Theodore the Recruit (Tyro) was a soldier in the city of Alasium of the Pontine district (northeast province of Asia Minor, stretching along the coast of the Euxine, i.e. the Black Sea), under the command of a certain Brincus. They commanded him to offer sacrifice to idols. Saint Theodore firmly confessed his faith in Christ the Savior in a loud voice. The commander gave him several days to think it over, during which time Saint Theodore prayed. They charged him with setting a pagan temple on fire, and threw him into prison to be starved to death. The Lord Jesus Christ appeared to him there, comforting and encouraging him. Brought to the governor, Saint Theodore boldly and fearlessly confessed his faith, for which he was subjected to new torments and condemned to burning. The martyr Theodore climbed onto the fire without hesitation, and with prayer and gave up his holy soul to God. This occurred in about the year 306 under the Roman emperor Galerius (305-311). Unharmed by the fire, the body of Saint Theodore was buried in the city of Euchaita, not far from Amasium. His relics were afterwards transferred to Constantinople, to a church dedicated to him. His head is in Italy, in the city of Gaeto. Later on, fifty years after the death of Saint Theodore, the emperor Julian the Apostate (361-363), wanting to commit an outrage upon the Christians, commanded the city-commander of Constantinople during the first week of Great Lent to sprinkle all the food provisions in the marketplaces with the blood offered to idols. Saint Theodore appeared in a dream to Archbishop Eudoxius, ordering him to inform all the Christians that no one should buy anything at the marketplaces, but rather to eat cooked wheat with honey (kolyva). In memory of this occurrence, the Orthodox Church annually celebrates the holy Great Martyr Theodore the Recruit on the first Saturday of Great Lent. On Friday evening, at the Divine Liturgy of the Presanctified Gifts following the prayer at the ambo, the Canon to the holy Great Martyr Theodore, composed by Saint John of Damascus, is sung. After this, kolyva is blessed and distributed to the faithful. 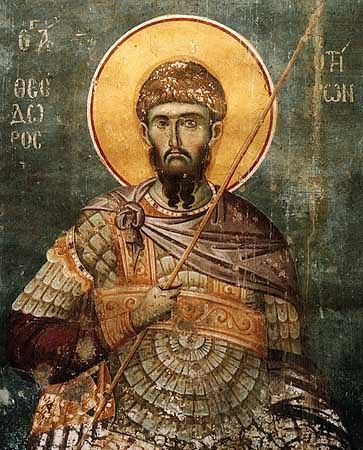 The celebration of the Great Martyr Theodore on the first Saturday of Great Lent was set by the Patriarch Nectarius of Constantinople (381-397). The Troparion to Saint Theodore is quite similar to the Troparion for the Prophet Daniel and the Three Holy Youths (December 17, Sunday Before Nativity). The Kontakion to Saint Theodore, who suffered martyrdom by fire, reminds us that he also had faith as his breastplate (see I Thessalonians 5:8). We pray to Saint Theodore for the recovery of stolen articles. Great are the accomplishments of faith, / For the Holy Martyr Theodore rejoiced in the flames as though at the waters of rest, / Offering himself as sweet bread to the Trinity. / So by his prayers, O Christ God, save our souls! Your faith in Christ was like a breastplate upon your heart: / With its aid, you overcame the power of the enemy. / Therefore you are crowned in eternity with a heavenly diadem.